Robinson Crusoe is the diary of a man shipwrecked on a desert island. He is alone for many years, but then cannibals arrive, bringing with them a prisoner. Can he rescue the prisoner? Will he ever escape from the island? TreeTops Classics are adapted and abridged versions of clas... read full description below. 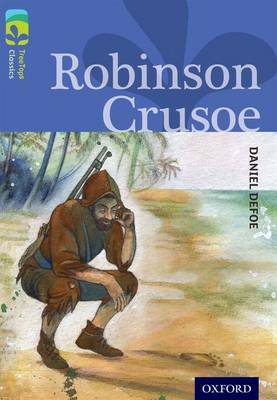 Robinson Crusoe is the diary of a man shipwrecked on a desert island. He is alone for many years, but then cannibals arrive, bringing with them a prisoner. Can he rescue the prisoner? Will he ever escape from the island? Exciting and powerful classic stories to enrich and extend your children's reading experiences. TreeTops Classics are carefully adapted versions of must-read stories which introduce your readers to significant authors, powerful plots and characters that have stood the test of time. These abridged versions of classics have been sensitively adapted by top children's authors to ensure that language and content is appropriate, but remain faithful to the original. These enchanting stories will appeal to all your junior readers and introduce them to a rich literary heritage. Each book includes author biographies and notes to help with historical and social context and any challenging vocabulary, ensuring the books are easily accessible. Each book contains inside cover notes to support children in their reading. FREE online teaching notes are available at www.oxfordowl.co.uk The books are finely levelled, making it easy to match every child to the right book.